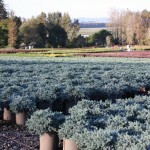 A slow growing, irregularly mounded shrub with steel-blue foliage. The needles are radially arranged around the branches, giving the appearance of stars. It prefers full sun and needs a well-drained soil. 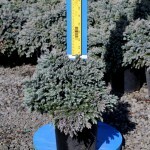 It tolerates a range of soils otherwise; drought tolerant once established. It may be used in foundation planting, mass plantings, or a rock garden.